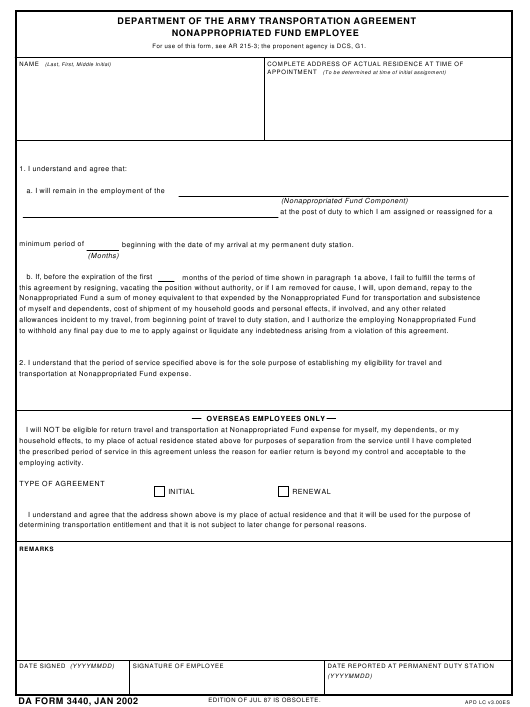 DA Form 3440 or the "Department Of The Army Transportation Agreement Nonappropriated Fund Employee" is a Department of the Army-issued form used by and within the United States Military. The form - often incorrectly referred to as the DD form 3440 - was last revised on January 1, 2002. Download an up-to-date fillable DA Form 3440 down below in PDF-format or look it up on the Army Publishing Directorate website. beginning with the date of my arrival at my permanent duty station. to withhold any final pay due to me to apply against or liquidate any indebtedness arising from a violation of this agreement. transportation at Nonappropriated Fund expense. determining transportation entitlement and that it is not subject to later change for personal reasons. EDITION OF JUL 87 IS OBSOLETE.